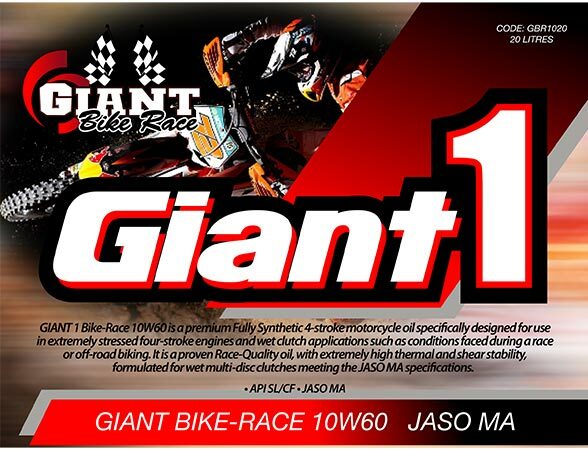 GIANT 1 Bike-Race 10W60 is a premium Fully Synthetic 4-stroke motorcycle oil specifically designed for use in extremely stressed four-stroke engines and wet clutch applications such as conditions faced during a race or off-road biking. 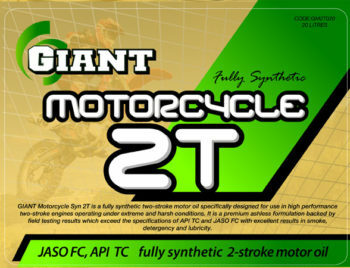 The combination of synthetic base oils with a unique system of enhancing additives, invented on the basis of modern scientific research of additive package technology, ensures that Giant 1 Bike-Race has the latest dispersant, detergent, anti-wear, corrosion inhibitor, viscosity improver, oxidation inhibitor, and de-foaming additive technologies with an extremely high shear-stable viscosity index improver. This formulation provides excellent engine protection, particularly useful in engines and clutches exposed to high thermal and shear stresses. 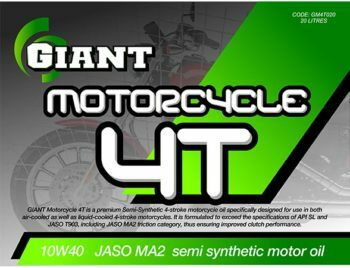 GIANT 1 Bike Race 10W60 is a race-quality oil that meets or exceeds the warranty requirements of most manufacturers for 4-stroke motorcycles with a requirement for JASO MA, API SL. Fully Synthetic base oils form a stable high-performance lubricating film that can withstand high temperatures, while still retaining a sufficient level of lubrication even after the engine has been shut down for some time. This retained film of lubrication ensures an easy start and reduces the cold start wear even under very difficult conditions. Significantly less bearing, ring, piston, cylinder and valve-train wear especially during high soot, high temperature and shearing stresses, exhibiting superior low volatility characteristics that result in improved oil consumption. High Viscosity Index = Stable viscosity that gives optimum acceleration & engine protection during start up as well as high temperature operation. Excellent detergency that enhances piston cleanliness and protection even while operating at high temperatures, and protects against bore polishing and scuffing. High performance or race motorcycles with 4-stroke engines, off- or on-road. Track or Rally racing cars. Passenger cars for day-to-day use. Cars racing on methanol fuel. Four-stroke turbo or non-turbo petrol/diesel engines under extreme high thermal racing stresses.